The Pit River Bridge is a 1094 ft long double deck truss with a highway (I-5) on top and a railway (Southern Pacific) on the bottom. It was built in 1941 as part of the Shasta Dam Project. There's an excellent article on this impressive bridge on Eric Sakowski's Highest Bridges website. The only additional information that I have is that Caltrans was approached by California's Department of Water Resources (DWR) a few years ago to take ownership of this bridge. 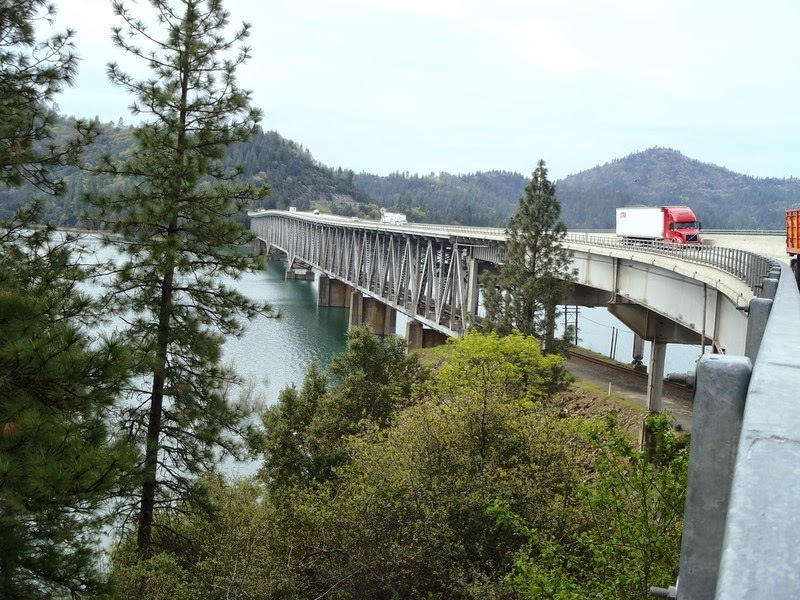 However, the bridge has never had a seismic retrofit and so Caltrans insisted that the bridge had to be safe for earthquakes before they could take it. Moreover, Caltrans told DWR that they would design the retrofit at what seemed a very high cost, and this was met with some consternation by DWR. However, they are both state agencies and so there is no actual cost to the state. Shasta County, California Bridges: Pit River Bridge (1) by Mark Yashinsky is licensed under a Creative Commons Attribution-NonCommercial-NoDerivatives 4.0 International License.